Let’s picture the true story of a wonderful Bais Yaakov girl in high school. Little does she realize that, not too far away, there is a Yeshiva that has a policy which will help ruin Shaina’s life forever. Let’s fast forward a few years. We see Shaina, our former Bais Yaakov girl, crying. She is carefully taking care of her soon to be deceased husband, “Chaim.” Chaim is lying in the ICU section of Memorial Sloan Kettering Hospital in Manhattan. Her two kids are at home, with a baby-sitter. This time it is a baby-sitter – instead of their grandmother. The grandmother is too fatigued from watching them this past two weeks. At the Levaya the Rabbanim speak about how wonderful her husband Chaim was. It is all true. Chaim was a masmid. He had good midos. They do not mention that there was a policy in place at Chaim’s Yeshiva high school that helped contribute to Chaim’s death. It is now a few years after the funeral. Shaina is struggling financially. Her children are suffering from the fact that she is one person parent. They also suffer from the fact that neither parent was there for them while Chaim was sick. Shaina needs to work hard to provide the bare essentials. Yes, she receives assistance from the community, but things could have been different. Our once pretty, vivacious, vibrant Shaina is now no longer pretty, vivacious and vibrant. The toll of the past few years has left its mark. What was this policy of the Yeshiva with such far-reaching repercussions for Shaina? Let us first realize that Chaim, who attended the Yeshiva, looked up to older bochurim in the Beis Midrash. And the Yeshiva had allowed that situation to continue. It was “cool” to smoke, as bochurim in the Beis Midrash did it too. The role models smoked. That was the policy that helped contribute to both Chaim’s untimely death and Shaina’s current situation. It is time for us to demand drastic change in our Yeshivos. It is time to stop the madness. It is time to no longer tolerate smoking among the “older bochurim” as well. What is sad is that smoking is the largest preventable cause of mortality in the United States. It is also not bashert. Smoking is halachically considered a makom sakanah and one needs a lot of zchusim to remain healthy when one chooses to follow the appeal of smoking. Sixty percent of heart diseases are caused by smoking. 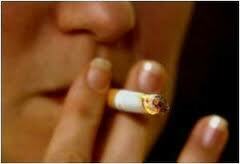 Ninety percent of lung cancers, rachmana litzlon, are caused by smoking. Recently, Reb Dovid Feinstein Shlita paskened that were his father alive today he would clearly state that it is completely and entirely forbidden from a halachic perspective. Rav Elyashiv zt”l ruled that there is now an addition prohibition of havara to smoke on Yom Tov because it is no longer halachically considered “ochel nefesh” – universal consumption. The Gedolim of Eretz Yisroel forbade the practice – it is not just Reb Dovid Feinstein either. We would not tolerate Chilul Shabbos in our Beis Midrash bochurim – why are we tolerating this other act which has such harmful repercussions to others? Notwithstanding all we hear about the deleterious effects of smoking, Yeshiva kids are smoking. The fact that high school kids are doing so is very disturbing since aside from the effects on the lung and heart, smoking actually reduces the rate of lung growth in teens. This ends up causing a number of other abnormalities. The character aspect of the child factor. In terms of the social influence factor, we must keep in mind that the most influential factor in why a kid begins to smoke is because his or her friends smoke. It requires a lot of character strength to avoid this influence. And no matter how strong our kids feel they are, many just don’t have the strength of character to resist the peer pressure. The experts say that if your friends smoke, you are twice as likely to start smoking by the next year. Another factor is if the parents, Rebbeim or teachers, or other role models smoke. This is called modeling the behavior. When parents smoke the accessibility of tobacco is much easier. Sometimes it is merely an older person (four to ten years older than our kids) who is modeling the behavior, such as a Beis Midrash bochur. Often the accessibility issue is coming from the role model. Someone out there is giving our kids cigarettes. Their rationale is, “Look, the kid will get it anyway, so I am just making it easier.” This enabler is wrong. If parents do not have an authoritative style, it is more likely that their kids will smoke. The problem is that when kids are away all day or in a dormitory it is very hard to monitor these things. The final factor is whether there is a strong anti-smoking message in the home and in the Yeshiva. According to the Monitoring of the Future Survey conducted in 2000, 38% of white 12th graders have tried cigarettes in the past thirty days of when the survey was conducted. Only 14% of black 12th graders tried it, however. Some experts feel that the reason is because black parents tend to be able to communicate their strong anti-smoking sentiments to their kids more effectively than white parents do. Clearly, we should tone up our anti-smoking message. When a Yeshiva allows bochurim in the Beis Midrash to smoke – this entirely undermines the anti-smoking message. performance are also strong factors. We can educate and create the environment where hopefully our children will make the right decisions, but we cannot make decisions for them. This idea can be very frustrating to a parent. The second thing we can do is to create and manipulate the logistical aspect of the environment to minimize or eliminate the behavior. This actually can be effective, but we must remember that it does not always work, sometimes earning us a backlash. The logistical manipulation, however does severely reduce the incidence of many of the undesirable behaviors. Concerned parents need to help effectuate this change. The Yeshivos need to implement the change. One suggestion might be that any Beis Midrash bochur (and high school student) that smokes should be penalized with a $500 fine. The fine or k’nas should, of course, be paid by the bochur – not the parent. And it could be paid to the Yeshiva too. Perhaps this fine should also be accompanied with a visit to a cancer ward and some Bikkur Cholim to be done. The visit to a cancer ward would not be “bitul Torah.” Research has shown that regularly smoking cigarettes on average takes some 11 to 13 years off a person’s life. Imagine how much Torah could be learned during those years. The fact that role models are engaging in a behavior that on average takes off 11 to 13 years of life is horrifying. It is something that should not be brushed aside. This is an issue where the Yeshivos and the parent body should work together in order to implement a permanent stop to the madness. You do realize that it is extremely rare for tobacco smoking to result in a death in such a short time. To be realistic, the story should have been about the problems of the children having hasna during the year of aveilos. The article admits that smoking takes an average of 10-15 years off life expectancy – yet the story has the person dying 40-50 years “early.” Being over dramatic does not help make the case but only leads to the author being seen as an ignorant alarmist. The addition to the title in “Yeshiva Boys Smoking”, actually has a powerful negative effect: teens are influenced more by what they perceive other teens do than just about almost anything else. For example in Micronesia there it became the “in thing” for teens to commit suicide! With that – wow! Thanks for the powerful article!! This is a sign of the lack of maturity in yeshiva borchu rim today. They are under NO pressure in the yeshiva that would be relieved with a puff or two. And the rebbe im are to blame for not putting a stop to it. Would a rebbi talk a bochur out of jumping off a roof? The same should apply to these cancer causing cigs. Bochurim need to grow up. I know many many many folks who smoked in their youth, quit when they became responsible adults, and lived long healthy lives. I also know folks who never smoked a day in their lives but nebach got sick and died young rl. The point is that it os rare for smoking in yeshivah to cause an early death. Moreover, Yeshiva policy has nothing to do with it. Those that want to smoke will do so despite any policies to the contrary. Its time to stop beating this very dead issue. Lichvod HaRav Hoffman, shlita – I’m not sure if leveling a k’nas will be of much help. Being that I live in Israel I don’t know what the matzav and mentality is in America. However, it would seem to me that there needs to be a great emphasis on the part of the Rabbanim to push the point that smoking is wrong al pi halacha and also to do away with the shtuyot of “Purim Cigarettes” which is the פתח for many smokers in our society. This needs to be emphasized not only in the Yeshivas, but in the community as well. Only when smoking is looked down upon in our society will things change. i myself only smoke one cigar a year on purim, but the seforim hakedoshim speak highly of smoking as a way to raise netzotzos and bring Moshiach – the Berditchiver Rov zya said the sign of a Jew is that he smokes during the week and smells tobacco on shabbos – however there are two answers to those claims – 1 today’s cigarettes are filled with poisonous chemicals that are dangerous and 2 the fact that medical science now says tobacco is dangerous all together (while in the old days it was healthy) indicates nishtaneh hatevah and therefore all of the netzotzos the Baal Shem Tov zya spoke of in tobacco have had aliyah so it is now assur to smoke (except for the tzaddikim of beis lelov and skulen who take a few puffs motzei shabbos kminhagum) so Moshiach is iyH right around the corner! Firstly, smoking triples the death rate during the middle age. So yes, it IS a major – and also the foremost – preventable cause of Almanos and Yesomim. Second, I don’t know what cave you’re from, but I’m a Youngerman from BMG, and it’s nothing more than myth (that smokers in Shiduchim like to propagate) that you’ll just get married and stop smoking – just like many other bachelor fantasies about marriage. I solved the problem for my daughters in a very simple way. The first question I asked was is he a smoker. The 2nd question was is he a mench. If the answer to 1 was yes or 2 was no, the shidduch did not go further. Gr8 article for all of the responsible adults who quit smoking long ago, however I really didn’t see any practical ideas on how to convince young teenagers or even older bais medrash bochurim who don’t understand the first thing about marriage family or kids not to smoke… remember at the time of smoking all these kids can only reason and think about themselves and if they feel fine and if they feel they can quit then they wont stop. and if you think $500’s will do the trick, nope that just makes the game more daring and fun and puts the ones who still smoke on a pedestal for being the brave ones who are not going to be scared off by a fine… and then what happens if one does get caught, and he simply doesn’t have the money to pay, now what throw him out and put him on the streets for not paying a fine???? that’s really going to get him to quit smoking and loose esteem in his peers eyes right? not a chance! So although I agree with you 100% that schools who allow older bochurim to smoke is a big issue that should be dealt with, however before you start writing these types of hypothetical articles please come up with some real practical solutions to the problems that can be realistically implemented first. Let’s stop to breathe a bit here. BH BH BH the amount of boys smoking now is FAR less than ever before. Now it’s not kewl to smoke. Yes, some smoke but it’s NOTHING like it was twenty, ten, or even five years ago. BH, girls are being more makpid and are not dating smokers. This is only indirect because when one starts smoking, dating is the FARTHEST thing on their mind. WE MUST GET THRU TO THE ROSHEI YESHIVA ON THIS INYAN. I WILL NEVER FORGET THE PTIRAH OF ONE OF RAV MOSHE’S GREATEST TALMIDIM WHO SMOKED CIGARS AND DIED OF LUNG CANCER. NOR CAN I FORGET THE 3 PEOPLE WHO, AS THEIR RAV DECADES AGO, I BURIED IN ONE YEAR, FROM EMPHESEMA/ LUNG CANCER. I HAVE BEEN AN ENEMY OF THE TOBACCO INDUSTRY ALL MY LIFE, AND GAVE DRASHOS AGAINST SMOKING FROM MY PULPIT. I EVEN PREVENTED A SHIDDUCH BY TELLING THE GIRL’S PARENTS THAT THE BRILLIANT YESHIVAH BOCHUR WAS A HEAVY SMOKER. IN LATER YEARS, THIS MARRIEDN FELLOW HAD A LOT OF SICKNESS AND GAVE UP SMOKING. BESIDES, IT IS NOW A VERY EXPENSIVE HABIT. I THINK THE GOVT. SHOULD IMPOSE SUCH A HUGE TAX THAT A PACK WOULD COST $1. OR MORE. I did the same. That’s the best way to protect your daughters and also get the boys to stop smoking. If they want to ever find a wife,don’t smoke! Smoking is a terrible and dangerous habit and this is the best way to turn it around. Every study in America suggests that the higher education achieved the smaller ratio of smokers to non-smokers. Why is it that people who learn in yeshiva, and have achieved the ultimate education don’t meet this model? I find it puzzling that cigarette smoking is so popular among the yeshiva bochurs. First of all, YB’s should not care about being cool. They should care about living a Torah life. Second of all, tobacco addition must surely diminish some of the joy of Shabbos, and for that reason alone it should be prohibited by yeshivas. Thirdly, as at least one other commenter said, cigarette smoking is agrueably a breach of the mitzvah to guard one’s health. I would venture to say that those rabbis who don’t see it that way have been duped by the tobacco lobby, which has been falsely – indeed, maliciously – denying the adverse health effects of cigarettes for years. Commenter no. 1 does make a good point – the exaggeration of the hazards of smoking does not help persuade adolescents to heed otherwise good advice. And what adolescent has the patience to read the long-winded soap opera that constitutes this article? Yes, we all know people who did dangerous things and lived, and people who didn’t do dangerous things and died. But it’s still ossur to do dangerous things. Imagine someone being makpid on gantze harchokos between meat and fish mishum sakono, yet smokes…like being machmir on tu bishvat and maikel on yom kippur. And you’re right–it is a very “dead” issue. As a father of four girls be”h I am telling you that girls don’t want smokers. We should require shidduch resumes to include either the word “smoker” or “nonsmoker” following the name. Smoking is certainly a more important factor to consider than the name of the school that a sibling went to. just get a bunch of roshei yeshiva to sign a letter stating that smoking cigarettes is worse than wearing a blue shirt. that should stop smoking cold. Smoking is terrible. That being said Rabbi Hoffman uses hyperbole and dramatizes the story to a point where anyone who knows anything about smoking will not pay attention to this article. In addition drinking is a much bigger problem because indeed the husband will not die instead he will live and be a burden to his family instead of a breadwinner. We need the yeshivas to stop drinking especially on PURIM where many of our kids emulate their Rebbeim and get their first taste of a vice that leads to many vices. Give me a break. PISSH. What’s next preventing driving because (unfortunately) their are car accidents? Or how about preventing junk food especially in the Religious communities because I see a lot of fat people and that is much more unhealthy. First, I agree the scenario that starts the article is unrealistic. It seems it would be rare indeed for a young man in his 20s to develop lung cancer that would kill him as a result of smoking. Second, you would think yeshivos and rebbeim would not need this mussar and would strive to be role models to their bachurim on every level. Why the yeshivos tolerate smoking, without concern for the effect of second-hand smoke on non-smokers, is puzzling, but it does seem the source of the problem. Third, it is symptomatic of something if bochurim take up smoking to be “cool.” One has to wonder the priorities of such boys. Finally, any girl who would even date a smoker, despite her parents approval of such a shidduch, needs to have her head examined. C’mon y’all, you really need to take a make chill pill. What do you think the Yeshiva bocher percentage is that smokes? I think if I said 5%, that would be too high. What about all the OTD out there, boys and girls, who smoke? Their percentage is MUCH MUCH higher. SO THEN GET ALL THE RABBIS AND PEOPLE LOOKING LIKE YESHIVA REBBIM STOPPING TO SMOKE AS WELL. Cigarette smoking approximately doubles a person’s risk for stroke. As a yeshiva bochur I can say that NO yeshiva activley promotes smoking. They let bochurim aged 18 and up making there own conscience decision to do what they want. And even if they made rules nobody would listen. In my opinion I find it worse that most yeshivas dont offer healthier food choices. The scenario that this article gave is extremely exaggerated. But what isn’t an exaggeration, in “Shaina’s” case is tending to a diabetic husband who never took care of his physical health as a teen, and now can’t lose weight because of his slower metabolism, so he developed diabetes, heart disease, other forms of terrible cancers, Hypothyroidism, and etc. As well as endured multiple amputations due to his diabetes and poor blood circulation. The list of horrific problems affiliated with obesity goes on and on. But fortunately today there is an option to being obese. Laparoscopic gastric surgery at NYU. It has changed so many lives! Anyway the smoking “issue” in yeshivas is that they don’t provide more ashtrays. That’s why you see cigarette buts everywhere. to Mark Levin and others who don’t think smoking is rampant……When my husband dropped off my son at the Irvington dorm, he described to me the scene he witnessed: cigarette butts all over the inside stairwells and halls reeking from smoke. When our (non-smoking) son moved out of the dorm we had to throw away his suitcases and other items because of the overwhelming stench of smoke (and he was only there for six months!). How bashert! Just saw this article in the Yated online…Rav Elyashiv, zt”l, said smoking is forbidden. I can’t believe someone wrote a letter to BMG! HAHA! Shockingly, my 7th grade talimdim have admitted to me that they DO smoke “betzinah”….there’s mouthwash, powerful odor killing soaps, sprays that neutralize smoke aromas and cologne. So where does it come from? Yes, REBBEIM, PARENTS and OLDER SIBLINGS (who of course started smoking after they left bais medrash). It’s deffinitely COOL to smoke because everybody in class knows that “Moishe” is “mature”, he smokes. Is there any one single effective method to stop the smoking? Probably not, but if education stops only ONE CHILD, it’s one less potential catastrophe to bear. To all the naysayers, I daven that you remain healthy and one day soon, realize the myriad damages caused by your expensive and useless suicidal habit. I’d rather see ex-smokers chewing tobacco and spitting in spittoons. Sorry TzViD – You are gravely uninformed. The latest statistics indicate that two thirds of smokers die as a result of their habit, whereas a dwindling one percent die as a result of car accidents. Smoking is the leading cause of preventable death. I cannot fathom who would’ve typed this trash in half sincerity. You all know it is against Torah and also stupid as to your health and it smells unpleasant. I was 44,b’h when my teen-age kids asked me to stop smoking. I stopped that day. I am now 86, Baruch haShem, and at least one of those moments of my life so far has to be from not smoking. Ridiculous article. As someone extremely involved in multiple yeshivos. There are basically no Yeshivos (in America) that tolerate smoking by anyone anymore. Kids smoke because of peer pressure which has become less then in years pass. When i was in high school 50% of my shiur smoked. In all 3 yeshivos i am involved in (on a very personal level with the boys) 14 boys smoke and every single one of them had older brothers who smoked their entire yeshiva career. The pressure came from family – not yeshiva. Stop blaming every ridiculous thing on Yeshivos and tell the families to start having some accountability. money rules!!!!!!!!!!!! you serious – get tufffff!!!!!!!!! It is illegal to sell cigarettes to minors, yet boys as young as 13 and 14 are smoking. Where are they getting the cigarettes from if they can’t buy them? Their fellow bochurim who are old enough to buy them legally are getting them for them. Some of these peddlers actually have the unmitigated audacity to charge a service charge for procuring them for their young friends. Well, let me tell you something…YOU ARE RATZCHIM! How dare you buy cigarettes for someone’s precious son! It’s bad enough you’re killing yourself, you don’t have to take everyone else’s son with you. Shame on you. You’re going to have a lot of explaining to do after 120 years, if you live that long. Perhaps it’s time for the rabbanim to decree that smokers have to be buried with the suicides. I always wondered about the glue used in cigarettes. Is it Pesachdik? If we’re worried about the glue on paper towels, why aren’t we worried about the glue, if there is any, in cigarettes? good idea!! dont let me get married cause a 15yr old kid might not give in to peer pressure cause of that! teens are teens and boys will be boys. its very nice that someone in yeshiva is supposed to a perfect tzadik, but there are social hardships and growing up to deal with. not everyone at that age is able to be r chaim kanievsky in avodah. and agreed, no yeshivas let smoking at the ages when boys start. so funny how everyone loves to bash yeshiva guys and yeshivas. 41 posts. I dont care how many butts you found in the hallways or wherever, the overall percentage is VERY VERY VERY low. Smoking is more common among the less educated, the lack of proper science education in many yeshivos will produce more smokers. The less sophisticated mind cannot grasp things like statistics and offer yeshivishe lomdus instead. Incidentally, playing fast and loose with safety rules is also a common outcome of disrespectful attitude towards civil government (“thats for goyim, we are bnai tayroh, we are above that”). This produces higher frequency of reckless driving, non-usage of seatbelts, removal of batteries from fire alarms, use of non-licensed contractors, off-the-books investment schemes etc.